Poor logistics, high war casualties on the Eastern Front, and shortages of military equipment and food have left Russia’s capital Petrograd dangerously unstable in the latest developments from #1917Live, RT’s social media project in which we cover the events of 100 years ago in real time. Last year’s Brusilov Offensive brought Russia initial gains against the teetering Austro-Hungarian Empire, but petered out due to supply problems, adding around a million men to the casualty list. In all, more than a million men have died, and over four million have been wounded. 1.5 million deserted the army in 1916 alone. Nonetheless, a conference of the Entente powers in Petrograd is plotting a new offensive. “Our allies can rightfully expect Russia to meet obligations in full,” tweeted Nicholas II, who personally took command of the army in 1915. Despite its losses, Russia alone still has more manpower than all the Triple Alliance powers put together, and tens of thousands of soldiers move through Petrograd, a major transport hub on the way to the front. “Troops keep coming to Petrograd. We’re packed in like sardines in these barracks, but newcomers don’t seem to be rushing to the front line,” Captain Vasily Zeitlin tweeted. “Saw another unit of recruits here in Petrograd. They're so bewildered by tramways & coquettes that they can’t even march in step,” wrote Vladimir Khlebtsevich, a student at the local university. Meanwhile, food prices have risen six-fold through the winter, and the city has stocks of no more than ten days, resulting in serpentine queues. Battling freezing temperatures, the crowds of mostly women sometimes resort to violence and looting. Intermittent political protests, some spontaneous, others planned, such as the 12th commemoration of the failed revolution of 1905, have shaken the city. The reconvening of the increasingly non-compliant Duma is certain to be another flash-point. The Tsar has already called for its dissolution, though is now reconsidering his decision. But it’s not just the bourgeois deputies that are skeptical. Aleksandr Krymov, one of the top Russian generals, told the head of the Duma, Mikhail Rodzianko, that those on the front have lost faith in the command of Nicholas, but, equally importantly, that his ethnic German wife Alexandra, who oversees domestic affairs, is even more unpopular. Still, Rodzianko and other Duma deputies are not publicly advocating violence. The same cannot be said for ordinary workers, on the verge of starvation. Lieutenant-General Sergey Khabalov, appointed to oversee the Petrograd military district, assures Nicholas that the government can still maintain order. The revolution – now less than a fortnight away – is awaiting a spark. 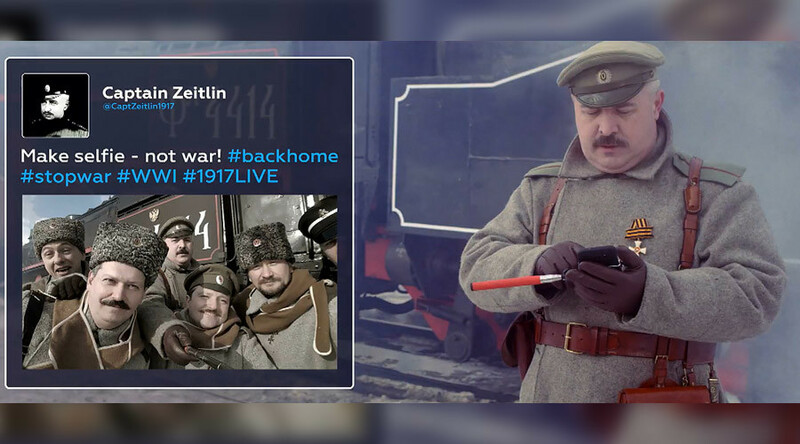 You can currently follow the project by searching for the hashtag #1917Live on Twitter, and on February 27th we will be launching 1917.rt.com, a dedicated site through which you can see the latest live broadcasts, photos and updates from the year of the Russian Revolution.